Welcome to Myanmar. Settle into your hotel for a two night Special Stay in Yangon. (Please book flight to arrive by 5pm). Freechoice: Hunt for gifts and handicrafts at Bogyoke Aung San Market. Alternatively, embark on a guided tour of Yangon’s thriving art scene, or ride a ferry across the Yangon River to Dhala village. As the sun begins to set, wander around Shwedagon Pagoda and learn about the ritual of ‘oil lamp lighting’ before partaking in this local tradition. On your drive to Pyay, pay your respects at Htaukkyant Allied War Cemetery. On arrival, you’ll board the luxurious Scenic Aura and relax at the welcome cocktail reception. Start with a visit to Shwesandaw Pagoda before heading to Sri Ksetra, the ancient Pyu Kingdom’s capital and also Myanmar’s first World Heritage-listed Site. Later commence your cruise north into the heart of Myanmar. A morning of exploration awaits in Thayetmyo. Try your hand at putting on the oldest golf course in Myanmar, admire the region’s old colonial buildings and explore the gems at the local market before returning to the ship to continue to Magwe. In Magwe, explore the town by traditional trishaw, similar to a side car. Visit Mya Tha Lun Pagoda, a mesmerising architectural vision set on Naguttama Hill. Enjoy the remainder of the day cruising to Salay. On your morning walking tour of Salay admire a beautiful teak monastery and look inside the largest lacquer Buddha in Myanmar. Soak up the ambience of the river and the colonial feel of the town whilst enjoying traditional Burmese tea and snacks in a restored colonial villa dating from 1906. After arriving in Bagan visit the most iconic sight of this hypnotic region, the Ananda Temple before travelling by horse cart through a local village and the surrounding temple ruins. Optional Hot Air Balloon Flight – Take a hot air balloon flight over the majestic temples of Bagan. Must be purchased prior to your cruise. (Plese note: available only from late-October to mid-March; all flights weather permitting). Freechoice: Venture to Mount Popa, home to Myanmar’s nats or nature spirits, before heading to a Toddy Farm where a traditional lunch awaits. Alternatively, explore the markets at Nyaung U before discovering the Temple Circuit, or enjoy a visit to Old Bagan. Afterwards, learn all about the production of Burmese lacquerware. Rise early to attend morning alms for the local monks before being invited to eat mohinga, a traditional breakfast with the local people. Leaving Bagan, stop off at the traditional riverside village of Schwe Pyi Thar. 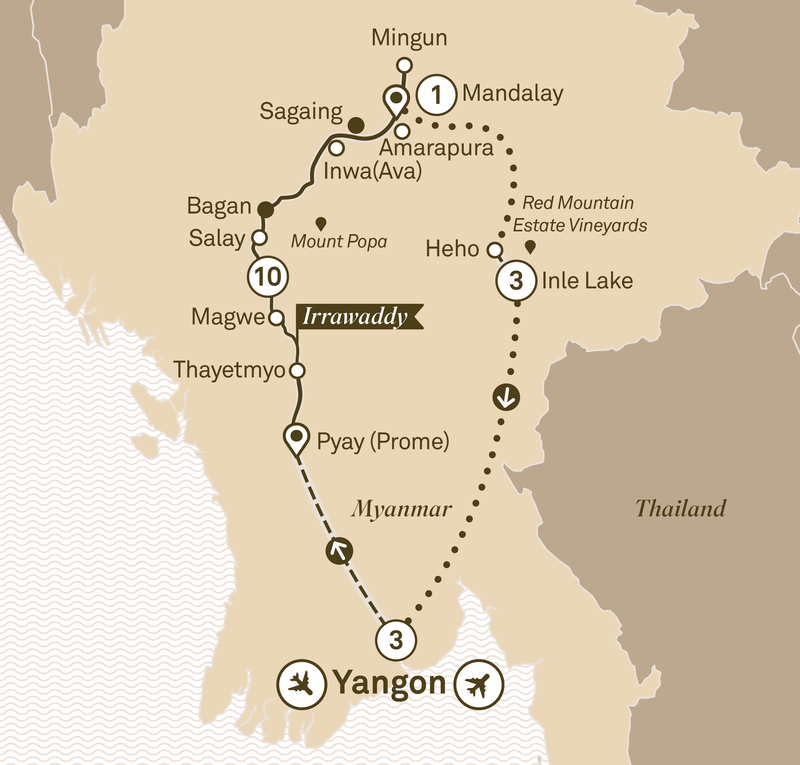 Sail to Yandabo where in 1826, the peace treaty ending the First Anglo-Burmese war was signed. Now famous for its pottery, stroll through the village and witness the craftsmen honing their craft and observe their unusual way of firing the pottery. In Sagaing interact with novice monks and nuns during a special visit to a monastic supported school before continuing to a quiet nunnery where you will partake in our donation to the resident nuns before their midday meal. Cruise to Mingun to discover the stories behind a massive unfinished brick pagoda. Admire the famous un-cracked Mingun Bell and the all-white Hsinbyume Pagoda. Sail to Mandalay to visit Amarapura. Enjoy an evening drink in boats under U-Bein Bridge, the world’s longest teak bridge, to capture that memorable photo of the bridge at sunset. Later, enjoy your last dinner on board. As the sun sets, head to Mandalay Hill to enjoy the magnificent views before staying a night at Mandalay. Fly to Heho and stop at Shwe Yan Pyay Monastery, before continuing to Nyaung Shwe. Glide across the waters of Inle Lake in private long tail boats towards your three night Special Stay. This afternoon relax at Red Mountain Estate Vineyards for some local wine tasting. Learn about traditional cooking with a visit to a local Intha family home for lunch and a hands-on cooking demonstration. Freechoice: Visit Pindaya Caves and try cooking local cuisine, or travel deep into the Shan Hills to the hidden ‘forest of temples’ at Kakku. Alternatively, take a local village trek close by. Enjoy some evening drinks, the perfect opportunity to share today’s tales of exploration whilst overlooking the stunning lake. Fly to Yangon for one last Special Stay. Undertake a walking tour through Yangon’s cobbled streets. Later, view the enchanting Kandawgyi Lake and visit Chaukhtatgyi Paya, Yangon’s reclining Buddha. Tonight savour your farewell dinner.